As a new photographer I am always looking for and thinking of new ways to use or find props. I got his idea in my head to use nursery wall letters as a prop. I got in contact with Julie at Pint Sized Designs and we worked together to figure something out. Usually when I get an idea in my head it never works out but Julie is great and she gave me a few different ideas and we decided to go with something that would work great with both a boy or girl and would really pop in black and white photos. I am in love with this picture!! 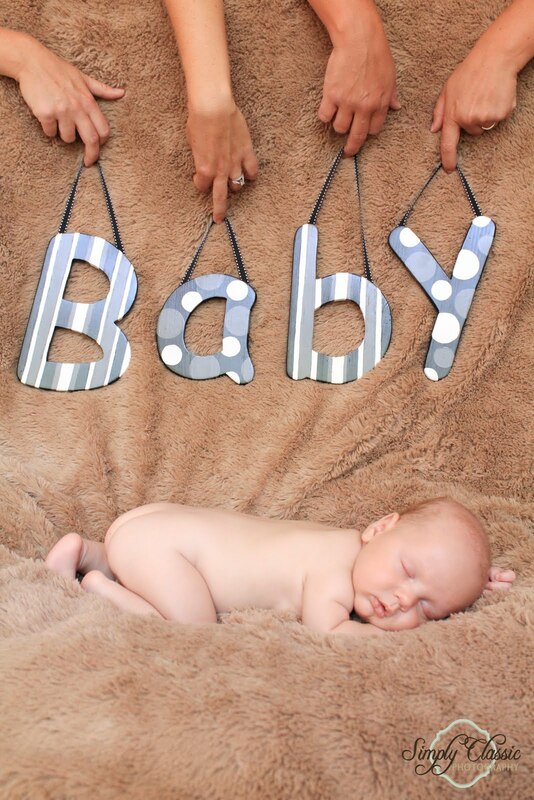 It took me 4 newborn shoots and this amazing sleeping baby to capture these images. 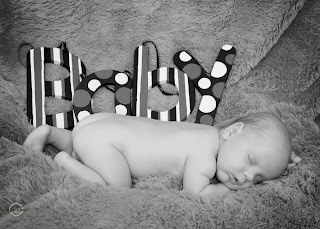 Its not easy placing wooden letters on a sleeping baby with out waking him or her but this little man was PERFECT and FAST ASLEEP! I also love this picture with the hands above. Perfect for adding the mommy and daddy's hands into the babies photograph in a different and unique way. It took me awhile to figure out how I would hang them but this came to my mind and I love the idea. No need to make it look like they are floating when you can have mommy and daddy's hands in the picture. It takes a perfect sleeping baby to use these but in a way that is perfect because I don't want to use the same props in every picture. I love how these turned out and I can't wait to use them again on another sleeping baby. Thank you Julie for working with me and being patient while I waited for a baby like him. I love the letters and I only wish every baby that came into my life had their name or initials on letters like these. Makes a picture personalized and is great for framing or hanging on their wall. If you know someone having a baby or in need to wall letters for their child please check out Julie at Pint Sized Designs. Not only is she great to work with and has great ideas but she is also extremely patient. What an adorable shot! I love this idea! What a sweet precious baby too! Very creative Erin--they turned out great. I love the pic with mommy and daddy holding the letters. I prefer it in color. 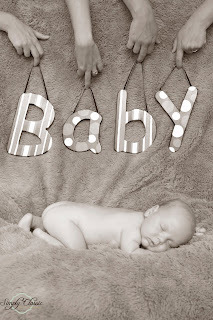 I almost always prefer color over black and white for some reason...especially with baby pics. I guess it's becasue they are so soft and pink and kissable...that doesn't come across as well in black and white.